Acta Marine’s 120 POB walk-to-work vessel’s hull construction passed the halfway mark late July 2017 at Crist shipyard in Poland. The ULSTEIN SX195 designed vessel is purposed to be used in addition to the CSV 'Acta Orion' on offshore wind construction projects and/or related markets. 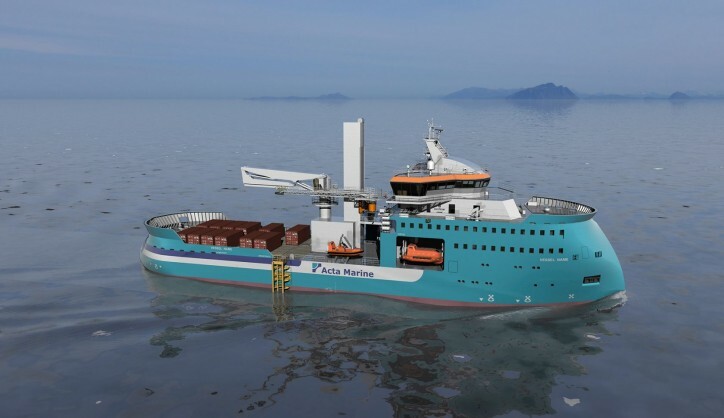 The construction support vessels will be used on offshore wind construction projects or for decommissioning and Oil & Gas services, according to an Acta Marine statement. The hull construction started at Crist, Poland, in February 2017, and the completed hull is expected to be towed to Ulsteinvik, Norway early November 2017. Thereafter Ulstein Verft will complete the outfitting of the vessel and the installation of the SMST provided mission equipment - motion compensated gangway and 3D crane. Delivery of Acta Marine’s CSV-120 is slated for end Q1 2018. The vessel will break new grounds in workability, in-field agility, offshore logistics and comfort on board combined with a low fuel consumption. The work is progressing well and on schedule, with delivery slated for end Q1 2018.